Looks quite similar to the flag of Cuba, doesn't it? “”This is an island surrounded by water. Big water. Ocean water. 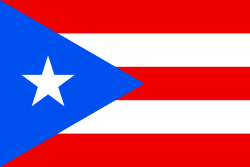 Puerto Rico is an unincorporated United States territory that was won from Spain in after a splendid little conflict known as the Spanish-American War. And Spain had previously taken Puerto Rico from the natives. In spite of having over twice the population of Hawaii, which joined the Union at around the same time, it's still not yet a state. Reasons for why this is the case range from "it's too poor and they'll have to pay income taxes" to, strangely enough, "they aren't Americans", while in reality, it's quite likely this is related to its strong support for the Democrats. The region and country are divided between statehood, independence, or status quo. This geography-related article is a tub. This page was last modified on 5 March 2019, at 23:23.